StageBuzz.com: FRIGID New York Interview - Dr. ML Godin of "The Spectator & the Blind Man"
FRIGID New York Interview - Dr. ML Godin of "The Spectator & the Blind Man"
Dr ML Godin (writer, director, costume designer,host) is a writer and performer whose autobiographical treatment of Helen Keller's time on vaudeville called The Star of Happiness is proud to be one of Horse Trade’s touring shows. She received her Ph.D. in early modern literature from NYU’s English department in January 2009 and has taught many classes on poetry, literature, and the great books of Western Civilization. When she is not teaching and writing she performs at comedy, storytelling, and variety shows such as Tell Your Friends, The Liar Show and Alter Ego. She is a proud winner of the Moth Story Slam and the faithful sidekick of Sideshow Goshko! 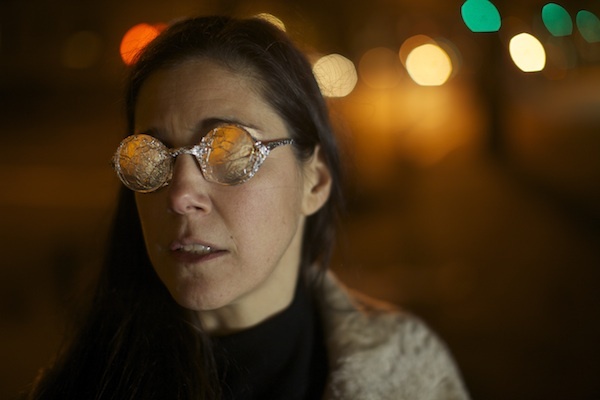 The Spectator & the Blind Man is Godin’s first ensemble piece and her debut as a director. The Spectator & the Blind Man is about the history of the invention of braille, which starts with a sideshow spectacle and ends with revolution as told by six actors who are more or less blind to the parts they play. When I first arrived in New York, it was as a grad student. I was interested in the relationship between metaphorical light and blindness and their literal counterparts. I read books on the history of the education of the blind and found some very interesting little stories that did not fit neatly into the grand narrative, but that nonetheless kept popping up in all the otherwise dry histories of progress, for the good reason that they were good stories. After obtaining my PhD and finding a new life in the performance world, I finally hit upon my approach to these stories. It would be through first person narratives that are embedded in but do not mirror, the grand historical arc. These little stories of triumph and degradation reveal shimmering microscopic views that complicate the history in which they play. I am so flattered to have so many talented artists get on board for this splattering of my inner landscape on stage! Most of them I've met through the downtown performance scene where I have often witnessed their talents as writers, musicians and comedians. Some are collaborators and coconspirators of long standing with whom I have thought deeply about the creation and execution of art. And several of us have a strong academic background which gives this project its deep and nerdy roots in source material. This is a dark and humorous work inspired by my research into the history of the education of the blind and informed by my own degenerative eye disease. It is for the metaphorically and literally challenged, which means that no one escapes the gentle finger pointing! Our target audience would be readers of history and philosophy, lovers of speculative fiction, nerdy intellectuals with a steam punk aesthetic as well as those interested in the visual arts. We have one painter, one dancer, one conceptual artist, one filmmaker, and one art historian all working to make the show spectacular. The great thinkers of western civilization, authors of speculative fiction who write with a sense of humor about histories great and small, as well as the scrappy artists and performers I have seen and worked with in the East village performance scene and its surroundings for almost a decade. I am looking forward to My Box and Sisters Grimm as these are shows of friends who I have watched and learned from for several years. I am also hoping to rope in a verbally adept sighted friend to go with me to A Day in the Life of Miss Hiccup so that I might experience that show! I will finish this collection of stories of Seeing & Not-Seeing. I have twenty in various stages of completion, six of which are featured in this stage production. The first story "How I Became a Cyclops" inspired my dear friend Nellie to make a painting of The Cafe of the Blind. We plan to take the show to San Francisco, where I and Nellie are from, and make an art/theater spectacular! Beach or mountains? Splendidly craggy gothic Alps! Black box or proscenium? We have a deep black box heart with a vast proscenium point of view! Glee or Smash? Brain smash!